Face-to-face feedback with any of the SOT staff during operating hours. Telephone communication (+65 6737 6266), Tuesday to Friday from 9 a.m. to 6 p.m. Written communication via e-mail to sot@chc.org.sg. 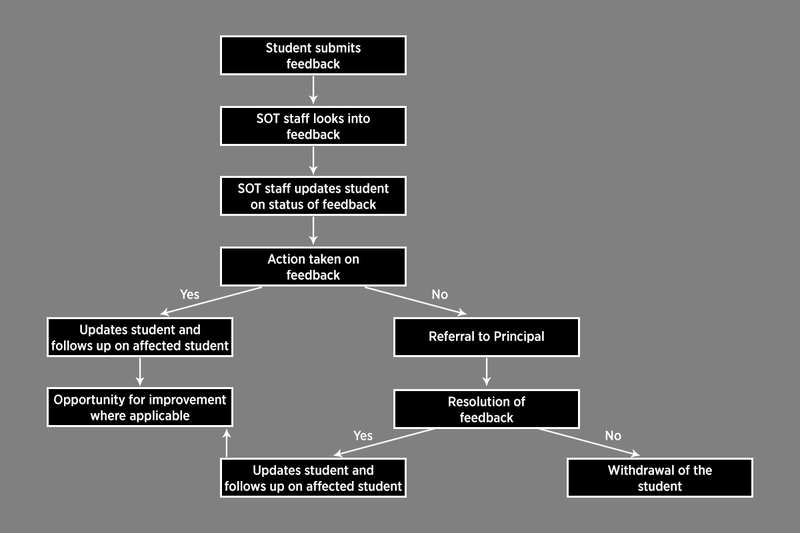 An incident report form may be downloaded from the student portal and submitted to any of the SOT staff. Student feedback is important to us. We have staff assigned to manage student welfare, and we aim to respond within 24 hours. Depending on the complexity of the feedback, our response time may vary, but will be kept within 14 working days. Complex cases will be referred to the Principal.